Conference On Cancer Science & Stem Cell Research 2019 : Vydya Health - Find Providers, Products. 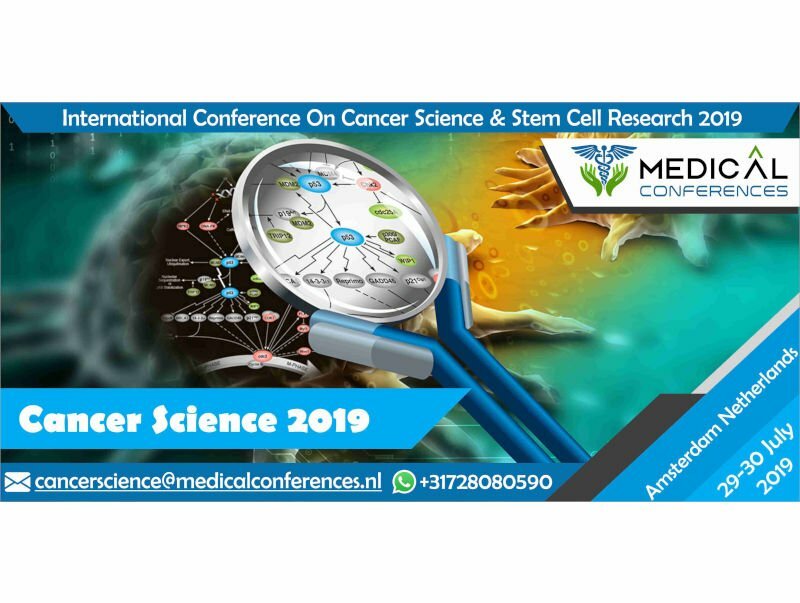 Medical Conferences is proud to host the “International Conference on Cancer Science & Stem Cell Research” from July 29-30, 2019 in Amsterdam, Netherlands. This year’s theme is “Advancement in the Arena of Cancer Science & Stem cell Research”. Cancer Research 2019 will provide an unprecedented opportunity for Oncologists to share their research with colleagues, and discuss and debate the latest advances in the arena of this field. We invite Oncologists, pharmacologists, and scientists, stem cell researchers and expertise in related disciplines to come together and inform each other in an environment conducive to education and interaction. Highly experienced scientists, young researchers, career raising professionals are all welcome. With an array of keynote presentations, panel discussions, workshops, and poster sessions, the Cancer research 2019 conference is the perfect venue not only to dive into your specific Oncological interests but also to expand the scope of your knowledge.